Daytona Beach Wedding Season is here. May -Sept brides and grooms are planning their wedding and they are looking forward to a beautiful ceremony on Daytona Beach. From the decorated wedding arch, to the tiki torches, rose petals at your feet. Mrs Marlo at Elegant Weddings will make sure your day goes off without a hitch. I can handle all the details of planning your Daytona Beach Weddings, the packages I offer are very affordable and there is a lot to choose from. When choosing your Daytona Beach Wedding Officiant, look no further than Mrs Marlo's Elegant Daytona Beach Wedding Packages. Call anytime day or night, I am here to help you plan your special day. This week was one of the busiest weeks for Daytona Beach Weddings. We have incorporated our limousine service with the wedding packages. It is so easy for a bride to have a one stop shop for her Daytona Beach Weddings. The limousine is always stocked with Cold Champagne and Bottled Waters on ice, Red Carpet Treatment and our Professional Chauffeurs. 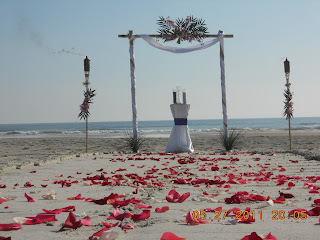 I have met some amazing couples who have chosen Elegant Daytona Beach Weddings to perform their ceremony on the beach. All my couples are my top priority and I will make sure your special day goes exactly how you have dreamed. Thank you all for choosing my wedding services and I look forward to hearing from you again in the future when its time to renew your vows. I have had the honor of working with Bill Vodek Photography for over 4 yrs now. He is amazing and all my couples love him. The packages he offers are top notch, very affordable and he is so flexible. His photos are beautiful and he captures the look of the brides and grooms natural beauty. I thank him so much for always being there and doing such an amazing job. If your looking for a professional wedding photographer in daytona beach make sure you give Bill Vodek at Vodek Photography a call. Mrs Marlo Denning, as she has become affectionately known, is an ordained nondenominational interfaith minister . Mrs Marlo works closely with the Bride and Groom in reference with there own special ceremony. In addition to the usual venues, Mrs Marlo will perform wedding ceremonies on the beach , in the park or at a private residence. Weddings & Marriages in Flagler,Volusia, St Johns County.Personal & Dignified Interfaith Civil Humanistic Remarriages, Elopements, Anniversaries, Renewels of Vows. Mrs Marlo was a nurses aide for over 23 years and has a caring heart and would love to have the blessing of being a part of your very special day. I will provide all types of ceremonies and will offer the wedding items that you wish to have for your day.